Represented was Time To Electrify http://www.timetoelectrify.ca with their EV Duty EVSE, Ma Leaf Une Passion https://www.facebook.com/groups/MaLEAFunepassion/ with a Nissan Leaf, Carleton U http://ravensracing.com/ and EV Club EVCO http://evco.ca/ with president Gerard Gavrel. There was a steady flow of visitors keeping all of the EV owners busy answering questions about their vehicles and experiences as an EV owner. The EV Showcase was part of Green Energy Doors Open (GEDO) Ottawa http://ottawagedo.org . Politicians attending GEDO included the Ottawa Mayor Jim Watson, the Ottawa city councillor for Capital Ward David Chernushenko, and the Ontario MPP for Ottawa Centre Yasir Naqvi who even displayed his i-MiEV! Paul Camire describes his 2012 Chevy Volt to participants. 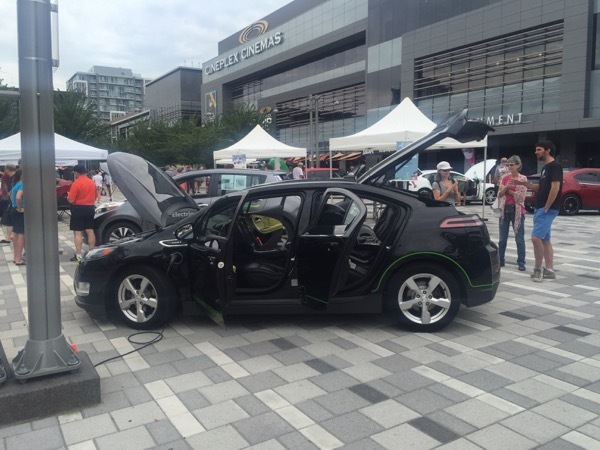 The Green Energy Doors Open event in Ottawa is the place to be for a fun and informative event celebrating Drive Electric Week. We'll have electric vehicles on hand to check out, including Chevy Volts, Nissan LEAFs, Teslas, Kia Soul EVs, Conversions, and more. You can hear directly from drivers about why they made the switch to drive electric. If you'd like to display your own EV, register here. There are currently 7 attendees registered. Registered attendees report 203,000 electric miles driven.